From time to time we may have rescued adults in need of loving homes. If you are looking for an adult Standard Poodle drop me a line even if I do not have any listed here I may know of one in need, I keep a waiting list for adults and notify you when something comes thru or if I see something. When emailing about an adult please include your location. OR if you have a Standard poodle who you can no longer keep for any reason please contact us, it does NOT have to be one of our dogs we are always ready to help a Standard poodle in need! Watch our facebook page for up to the minute leads on adult dogs in need of new homes, Standard Poodles do go quickly so if you are considering adopting an adult in need please move quickly to make contact. March 2019- Aspen is our latest RE-HOME she came to us due to a divorce situation in the family. Aspen is only 14 months old, has a natural tail and dewclaws. She came from AKC registered parents but has no papers because her previous owners opted not to purchase them with her. She knows basic commands-sit, stay, come, seems to be/and is said to be-housebroken as well. Aspen has been raised around children who were not properly trained in how to treat a dog, a year with abusive children has taught her to be cautious of the hand and she will flinch when you go to pet her head but she is very friendly and has been a great dog in the short time we have had her, the longer she is with us she seems to be getting past the flinching. For this reason I am reluctant to place her in a home with very small children, this sweetheart needs a break! She is cautious with strangers which is typical of a Standard but makes up quickly with new people.She is an excellent traveler and rides well in the car. Aspen loves attention and is just a happy go lucky girl! 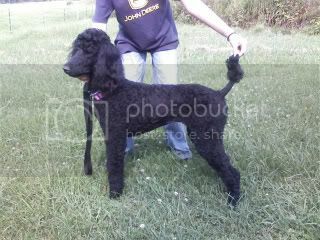 She is very smart and athletic and could possibly be a good obedience or agility prospect with a little time. She does need work on leash walking but I intend to work on that while she is here. She does jump up on people which we are working on also, since she only weighs 40 lbs it's not bad but still not something we want to continue. She has been trained on an invisible fence system and had free run of the yard. We have been slowly introducing her to our Standards and she plays wonderfully with them, she has met our small dogs thru the fencing and despite my chihuahua thinking she is Cujo Aspen did not react in a negative way to her. She really is a nice dog, very loving and deserves a great home. In her 14 months Aspen was only groomed one time so the grooming process was a bit terrifying for her, she will need someone dedicated to showing her grooming makes you feel better and a groomer willing to work with her, it is mainly her legs and feet that need work, but she is very good for nail trims, her previous owner used scissors to cut her which is why her topknot is short! In 2017 when all was said and done we rescued 17 Red and apricot miniature poodles from a bad situation, a puppy mill. What a heartbreaking and heartwarming experience it was for my husband and I, never have I seen such sad little creatures, all they knew were a life in a cage, sitting in their own feces, not much socialization. We vetted them, cleaned them up, got rid of their fleas, dewormed them and gave them their vaccines and most of all showed them love that they had never known. The first group seen below had been the worst as they were old enough to remember what happened to them, the second group were young puppies but still in very sad condition. I am happy to say that all the Rescue Reds have found amazing loving homes and the puppy mill was shutting their doors! The older group was spayed and neutered before placement and the young puppies went on spay-neuter contracts, We have been asked if we would open our hearts again to help poodle rescues and the answer will always be YES! 17 lives have changed and we are proud to be a part of that. If you breed, then rescue, save a life. July 2017 RED MINIATURE PUPPIES RESCUED! We are assisting in the care and placement of 7 miniature poodle puppies that range in age from 8 weeks to 18 months. Currently there are 2 boys and 2 girls still available, they have natural tails, and front dews, they will have their shots in process, worming, grooming, spay and neuter. these are beautiful puppies that have had a ruff start in life, we are working on house training and socialization, poodles tend to be very forgiving dogs by nature especially puppies. We are not placing them with families with small children because of their sheltered start, if you have a quiet home and time to devote lots of love to these babies please consider adoption, they love to cuddle and are soaking up the love they have never had before. fee is $250 ea. They will be small minis only about 12 inches tall when full grown. e mail me for more info! ALL OF OUR RESCUE RED MINIS HAVE FOUND WONDERFUL HOMES! Thank you to everyone who responded to Delilah's need for a new home, she has been placed in a home with her littermate and is VERY happy now! Dove is in need of a new loving home! UPDATE** Dove has found his forever home-thank you to everyone who responded to this wonderful boy in need! Dove's story is a very sad one. His person died of cancer. Dove's owner thought he had Doves care provided for. He had people that were supposed to stay and live in his house to care for Dove, Only once Dove's owner passed the people sold the house and more or less dumped poor Dove. Dove is a 7 year old, white, neutered male Standard Poodle. .He is of course house trained and crate trained. This guy is so kind and patient when grooming him. He is very well behaved and absolutely lovable. He gets along with everyone, men, woman, kids, cats and other dogs. Dove is as about as close to perfect as a guy can be. Dove is in Boston, Mass.although the rescue is in Pennsylvania. After many warning growls that were ignored by the adults in the family. Dove nipped at the 3 year old for pestering him relentlessly. I am always hesitant to adopt dogs to homes with very young kids for this very reason. He has been temperment tested since this incident and has no aggression issues. He just didnt know how else to tell the little girl to give him space since his family wasn't helping him. Adoption donation appreciated.